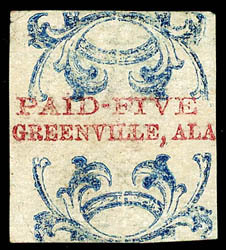 Confederacy, Greenville, Ala., 1861, 5¢ red & blue, unused, ample margins to touched, rich colors and strong impressions of the blue ornamental border and red town name and denomination, without gum as usual, trivial small corner creases at top and bottom left, Very Fine, ex-Brandon; with 1952 and 2006 P.F. certificates. ONE OF ONLY SIX RECORDED EXAMPLES OF THE 5¢ GREENVILLE PROVISIONAL. ONE OF THE FIRST BI-COLORED POSTAGE STAMPS TO APPEAR IN THE WESTERN HEMISPHERE. There are only four off-cover stamps and two covers recorded. The two covers bear uncancelled singles. Confederacy, Memphis, Tenn., 1861, 2¢ blue, large margins to just into frameline at bottom, tied by bold strike of "Memphis Ten. 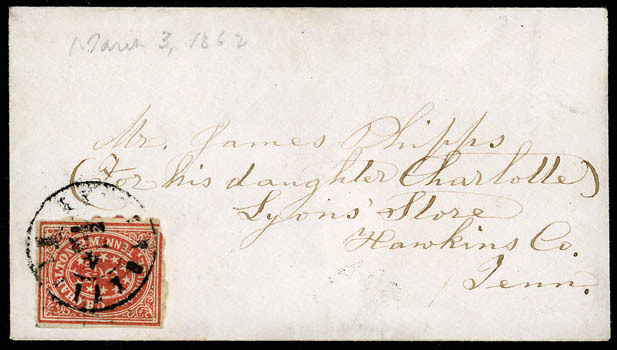 May 6, 1862" cds on blue folded part printed insurance policy addressed locally; vertical file fold, few faults only apparent, when the notice is opened, Very Fine, ex-Pratt, MacBride, Hart, Dr. Graves, Boshwit; with 2007 P.F. certificate. AN EXTREMELY RARE AND DESIRABLE 2¢ MEMPHIS PROVISIONAL USAGE PAYING THE 2¢ DROP RATE. THIS IS ONE OF THE FINEST OF ONLY FIFTEEN COVERS RECORDED BY CROWN. Samuel Mosby is believed to have been co-owner of the Mosby & Anderson Storage, listed in the 1859 Memphis City Directory. The business was located on Union between Second and Third streets (where the Hotel Peabody is today). The census by Billy Matz (Confederate Philatelist, Mar. 1967) identified twelve 2c Memphis provisional covers, and the Crown book reported an additional three covers. The cover offered here has a clipping of the Mozian auction description from 1941 affixed on the reverse, "…Mr. Pratt who plated this stamp and examined most of the known copies, mentioned it is the finest he has ever seen…". Confederacy, Knoxville, Tenn., 1861, 5¢ brick red, large margins all around except slightly in at bottom right corner, tied by "Knoxville Tenn, 3 Mar 1862" cds on small lilac-lined white cover to Lyons' Store Tenn., pencil "March 3, 1862" docketing at top left; sealed cover tear at top, Very Fine appearance, ex-Kimmel, Hill. A RARE KNOXVILLE 5¢ BRICK RED PROVISIONAL TIED BY HANDSTAMP ON COVER. 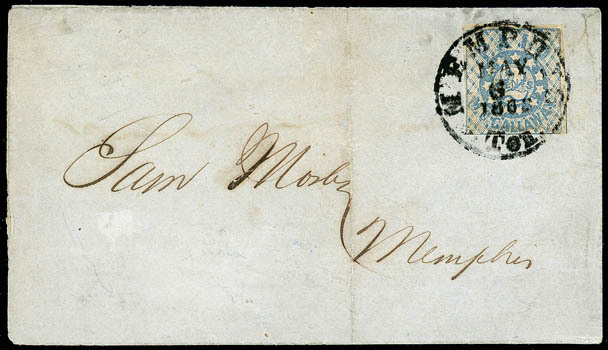 Confederacy, Baton Rouge, La., 1861, 2¢ green, full margins to just touched, bright color; sealed diagonal tear at left touches the word "Baton", without gum, Very Fine appearance, ex-Ferrary (purple trefoil on back). 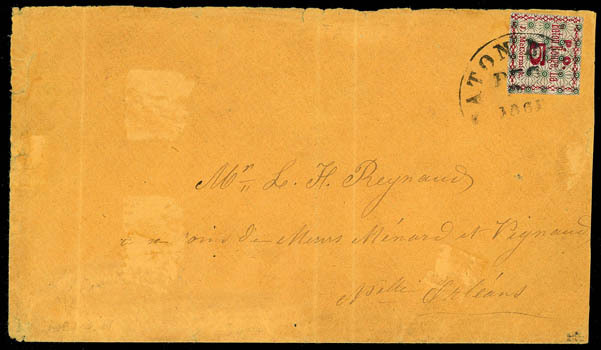 A RARE UNUSED EXAMPLE OF THE 2¢ BATON ROUGE POSTMASTER'S PROVISIONAL, ONLY FOUR EXAMPLES ARE RECORDED. 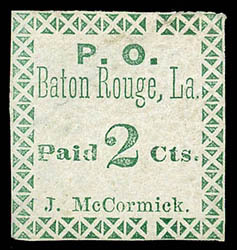 None of the four unused examples of the Baton Rouge 2¢ provisional are sound, including one with the "McCcrmick" error (11X1a). Confederacy, Baton Rouge, La., 1861, 5¢ green & carmine, large even margins all around, tied by partial "Baton Rouge La. Dec 9, 1861" cds on orange buff cover to L. H. Reynaud of New Orleans La. ; cover has minor scuff spots and small edge tears, vertical folds well clear of stamp, most of backflap removed, an Extremely Fine stamp, ex-Hussman, Worthington, Caspary, Skinner and D.K. Collection; with 2001 P.F. certificate. ONE OF ONLY 11 RECORDED ON COVER USAGES OF THE BATON ROUGE 5¢ CRISS-CROSS BORDER STAMP, THIS BEING ONE OF ONLY TWO WITH A FOUR-MARGIN STAMP. The Crown census records only eleven covers, all of which are single frankings. 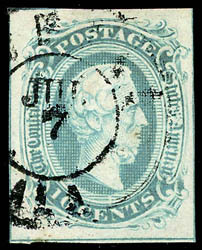 Only two covers have four-margin stamps with almost all covers having minor faults or flaps removed. 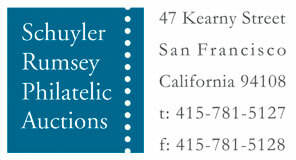 The addressee, L. H. Reynaud, was a member of the prominent Reynaud-Favrot family of New Orleans. Confederacy, Rheatown, Tenn., 1861, 5¢ red, Position 2 in setting, Type II with inverted ornament at top right, huge margins all around, deep shade, neat manuscript "X" cancel, Extremely Fine, ex-Hessel, Brandon. A GEM EXAMPLE OF THE RHEATOWN 5¢ POSTMASTER’S PROVISIONAL, ONLY ABOUT A DOZEN EXAMPLES ARE RECORDED. 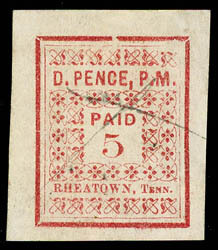 The 5c provisional stamps issued by Postmaster D. Pence were printed by the same printer who produced the Tellico Plains Tenn. provisional. There are about a dozen recorded examples including a unique unused pair and five covers. Confederacy, 1863, 10¢ blue, "frame lines", neat Mobile, Ala. town cancel, large margins showing full framelines at right and bottom with partial framelines at left and top, brilliant color, an Extremely Fine gem; with 2013 P.S.E. Graded certificate (XF-Sup 95, SMQ $8,250). A GEM USED EXAMPLE OF THE 1863 10¢ JEFFERSON "FRAME LINES" ISSUE. Confederacy, Charleston, S.C., 1861, 5¢ blue, margins large to just in at lower right and top, tied by neat strike of "Charleston, S.C., Oct 11, 1861" cds on cover to Camden, S.C., with red "Office of the Fire Alarm and Police Telegraph, Main Guard House, Charleston, S.C." imprint; cover with expertly restoration mostly along top edge, Very Fine appearance, illustrated in Calhoun book (page 76). Scott No. 16X1 Estimate $4,000 - 6,000. 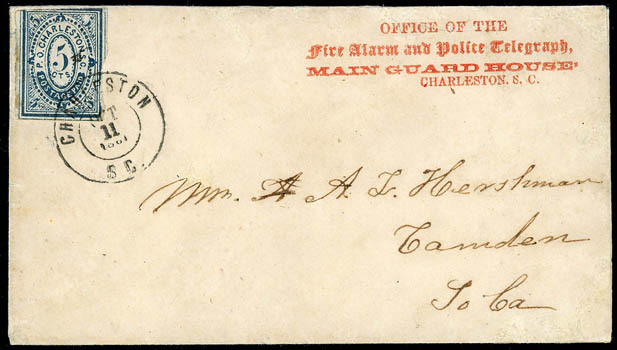 A WONDERFUL CHARLESTON POSTMASTER'S PROVISIONAL USAGE ON COVER WITH A FIRE ALARM AND POLICE TELEGRAPH IMPRINT. The Fire Alarm and Police Telegraph system was installed in Charleston by John Nelson Gamewell, a Camden S.C. postmaster and telegraph operator who purchased rights to the system in 1855 (the Gamewell Fire Alarm Company still exists). The first city to use a telegraph system to transmit fire and police alarms was Boston in 1852, followed by Philadelphia in 1855, and St. Louis, Baltimore and New Orleans between 1858 and 1860. The city of Charleston started discussions about using Gamewell's system as early as 1855, but apparently decided against it. In August 1860, the Charleston Courier reported that Gamewell was visiting the city again to demonstrate his product. On September 4th, the city council reviewed a detailed proposal from Gamewell, specifying the locations of the telegraph alarms (Charleston Courier, September 6, 1860), and shortly thereafter the city entered into a contract with him. Then in April 3, 1861, Charleston Courier reported that the system was operational. Exactly two months after this cover was mailed to Camden S.C., a fire broke out at a window blind and sash factory located at East Bay and Hasell Streets. It was reported to have been caused by a group of slaves who were gathered around a campfire. The fire quickly spread southwest and destroyed about 15% of the city before it was finally extinguished. Some sources say that efforts to control the fire were impeded by the fact that so many firemen had left to fight in the Confederate army. Robert E. Lee was in Charleston that night and observed the conflagration from the balcony of the Mills House hotel before its proximity forced him to leave. Sanitary Fair, Philadelphia, Pa., 1864, 10¢-30¢ complete, slightly overlapping on locally addressed cover, each canceled by faint manuscript "X" in pencil and 10¢ tied by "Great Central Fair, June 11, 1864" cds, Very Fine, a wonderful and extremely rare complete set on cover; with 2017 P.F. certificate. ONE OF FOUR KNOWN COMPLETE SETS OF THE GREAT CENTRAL FAIR STAMPS ON COVER. The Great Central Fair stamps were engraved and printed in Philadelphia by Butler and Carpenter who were producing revenue stamp at the time for the Treasury Department. 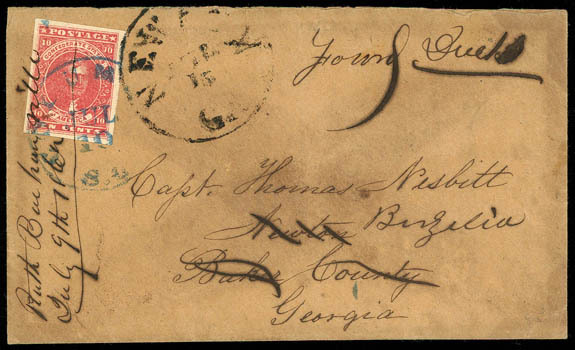 Confederacy, 1862, 10¢ carmine, large margins and beautiful, bright color, tied by blue "Columbia, S.C." cds on buff cover to Newton, Ga., forwarded to Berzelia, Ga. with balloon-style "Newton Ga. Jul 15" cds and manuscript "Fowrd Due 5" rating, corrected to "10"; 1862 docketing at left affects stamp, Very Fine, an attractive Carmine despite docketing affecting adhesive; with 2008 C.S.A. certificate.